5 Tips For Fall Gutter Maintenance • Gutters & Guards, Inc.Gutters & Guards, Inc.
Fall can be rough on your home’s gutter system. To help combat the fall foliage, it’s important to take certain gutter maintenance steps to make sure your gutters, downspouts, and gutter guards aren’t damaged during the fall season. In order to help you know the best way to maintain your gutters during the fall, we’ve got 5 tips for fall gutter maintenance! A major step to fall gutter maintenance that many homeowners overlook is trimming the tree branches around your home. 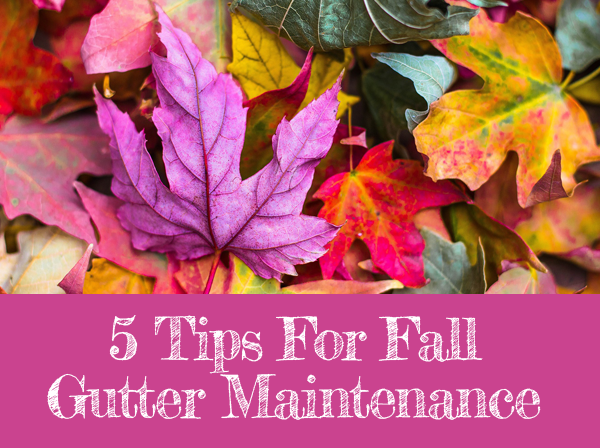 As the fall leaves and foliage begin to fall, they fall straight into your gutters and clog them. Trim the tree branches around your home and near your gutters to help prevent leaves from falling into your gutters. Although trimming tree branches will help lower the amount of leaves falling into your gutters, some leaves will still make it in. To prepare for the bulk of the fall leaves, make sure your gutters are clean ahead of time! Dealing with leaves and debris falling into already clogged and soggy gutters makes them harder to clean later and may even lead to permanent damage. Make sure your gutters are clean now before the worst of the fall debris begins. The fall season can be rough on your gutters. After your gutters have been cleaned, go over them and thoroughly check for damage. Make sure you check for loose screws, gutters pulling away from your home, leaks, excessive wear and tear, or anything else that may make your gutters less effective. If you’re not sure what to look for, contact a professional to inspect your gutters and look for areas that may need repair. Once you’ve identified the problem areas of your gutters and downspouts, it’s time to repair them. These problem areas can get worse during the fall and winter seasons and can sometimes even lead to permanent damage to your home, so it’s important to take care of the damage as you find it. You may be able to complete some easy repairs yourself, such as loose screws or brackets, but make sure you call a professional to repair any severe damage! The best way to protect your gutters in the fall and winter is to install gutter guards. There are a number of different types of gutter guards, including screen mesh, drop in, and the MasterShield Gutter Guard system. No matter which kind of gutter guards you install, their goal is to keep leaves and debris out while allowing water to run through. Gutter guards are invaluable in maintaining and preventing debris from damaging your gutters during the fall.